This recording is an extract from a lecture delivered to the Essex Branch of the Historical Association by Hilda Grieve in 1981 (SA 24/854/1). The lecture – entitled ‘The Rebellion of 1381 and the County Town’ – was given to mark the 600th anniversary of the Peasants’ Revolt. As the title suggests, the lecture considers the contribution of people from Chelmsford to the rebellion. The extract comes from the start of the lecture, as the speaker sets the scene by describing the extent and nature of Essex’s county town in 1381. It is a fascinating picture painted by a historian who may have developed a greater knowledge of the history of Chelmsford than any other. It may come as a surprise to learn of the humble nature in the fourteenth century of what is now the only city in Essex. The town was clustered around the High Street, representing a very small proportion of what is included in the city boundaries today. We can only speculate about what the sounds of the high street would have sounded like in the fourteenth century. However, the speaker’s detailed description of the commercial enterprises taking place allow us to imagine some of the sounds. Are there any continuities in the soundscape of the high street today? Hilda Grieve (1913-1993) joined the newly-created Essex Record Office in 1939 – the same year in which she was awarded the Alexander Medal of the Royal Historical Society – and continued in the post of Senior Assistant Archivist until 1966. 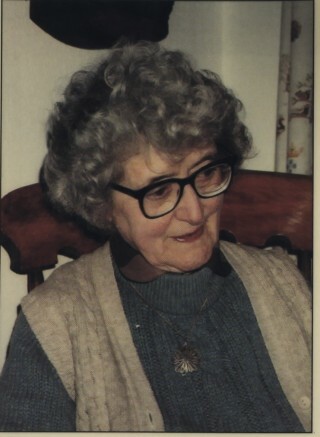 From 1966 to 1973 she was Deputy Editor of the Victoria County History of Essex. Her first major publication was The Great Tide (1959), written for Essex County Council on the subject of the 1953 floods in Essex. The first volume of her exhaustive history of Chelmsford – The Sleepers and the Shadows – was published in 1988 (as Essex Record Office publication no.100). This volume covered the medieval and Tudor story. The second volume, subtitled ‘From Market Town to Chartered Borough 1608-1888’, was published posthumously in 1994 (as Essex Record Office publication no.128). These titles are now unfortunately out of print. However, they can still be consulted at the Essex Record Office.